The world doesn’t stop moving when you’re not at your computer. We're making it easier to monitor and share your key Google Analytics data on the go with a new, updated Google Analytics mobile app. You can now download the new and improved Google Analytics mobile app for Android and iOS. The app works on all modern phones and tablets, in 39 languages and in all countries currently where Google Analytics is available. 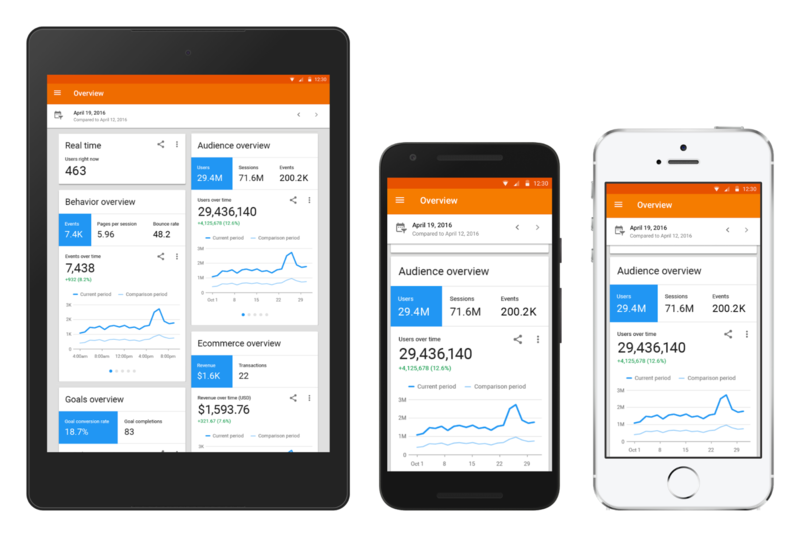 The new Google Analytics mobile app simplifies Google Analytics reports into a small screens format that puts an incredible depth of data at your fingertips. Want to track a specific key metric that's not there by default? You can now build or modify a report quickly and save it to your mobile dashboard. Find something interesting? Share it with anyone via email, social, messaging or in any manner supported by your device. Now you can keep up with what is happening with your sites and mobile apps anytime, anywhere. Download the Google Analytics mobile app today on Google Play (Android) or Apple iTunes (iOS). Note: The app currently supports portrait (upright) orientations on tablets and phones. Landscape support is coming soon.